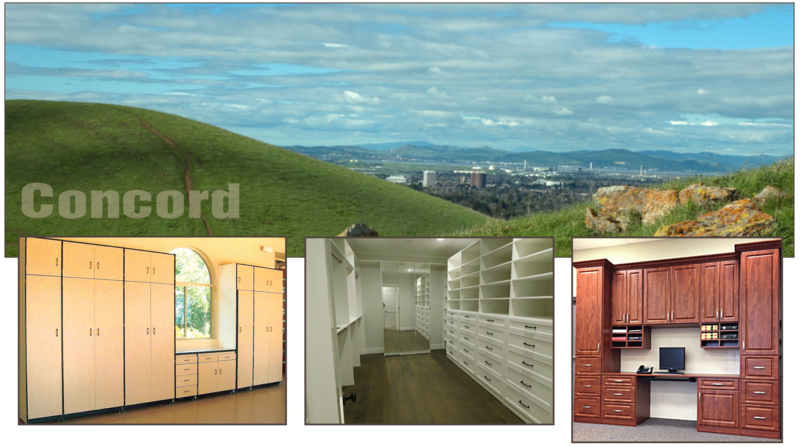 Concord, California - Alpine Cabinet Company "
Serving Concord since 1984, Alpine Cabinet Company provides personal and professional custom cabinet design and installation for garage cabinets, custom closets, home offices, and entertainment centers. As a longtime local family business, we have built and installed more than 32,000 custom cabinet projects in Concord and surrounding communities. Alpine specializes in providing storage and organization solutions with our creative garage cabinet designs, warm and inviting custom closets, professional home offices, and personal home entertainment centers. We build all of our cabinets in our state-of-the-art precision manufacturing plant to your design specifications. Organize and store all your tools, sports equipment, gardening implements and more in our durable garage cabinets. Transform your walk-in or reach-in closets into a model of efficiency with our custom closets. Turn extra space or an extra room into a professional home office. Store your electronics and display your collectibles in your personal home entertainment center. Contact us for the ultimate organization and storage solution. Serving Concord and the surrounding communities such as Pleasant Hill, Antioch and Walnut Creek.